Having experienced enough city moments we travelled West and found the little village of Heyope. Heyope is first mentioned in the episcopal records of 1398 AD. 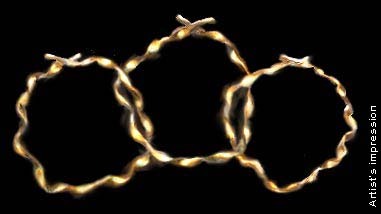 and it was at Heyope that they unearthed the famous three golden ribbon torcs thought to be crafted between 1600 to 1200 B.C.. (See picture). Close by, the HoBB Gardens grow – a ‘place’ for friends to explore and for them to find their own ‘Sense of Place’. Two maps of the original gardens exist – one to view and the other to understand. Little gates like the one created by Jeanne Corte ( see https://thehobb.tv/000194) lead out into the fields around and to a network of footpaths trodden for centuries. ALTHOUGH SIMPLE AND SPARE, the Fourth Room was not without its sense of style and purpose. Light blue painted, tranquil, but quiet. Those there, though friendly enough, looked enquiringly at the girl who had just that minute walked in. ‘Good afternoon fellow seeker’, said the HoBB Guide, ‘Let me introduce you all to this Seeker who is looking for her way in the wide world’. We do not know the specific author who gifted these words. A plain crisp envelope containing them was found at the HoBB Gardens, obviously placed here by a garden visitor but without a signature. If they were the seeker, they found much understanding here, and in return, put into words what we find more easy to express in feelings. From time to time, we are all fooled by fashion, tamed by reason and trapped by experience. Your surroundings influence you – you interact with them often without realising it. When I design living environments, I look forward, aiming to feel the total outcome of experiencing them. When I visit existing environments, I study the results achieved by their use before looking at their fixings and finishes. Through market research, we can only explore today, survey yesterdays and surmise the possible results of our actions. Market Research can help us to avoid designing further environments that have failed historically. Real ‘wisdom before the event’ in all areas of society, can only come through developing intuitive skills. We should all be designing today, for tomorrow, with a full understanding of the past. If this is your view too, you will be alongside friends when you open the door and enter the HoBB Gardens. If you intuitively have thoughts about opening your next door forward or wish help in creating more room for your infinity to thrive, we are already in contact with eachother, complete the circle and say hello. If you are a Seeker, how many doors have you opened so far? What room are you happy to live within? You are welcome to share your findings with us and we hope we can open doors for you – for here we will listen, and fashion an answer that is yours alone. Well, when I was digging out their water wheel shaft, days before the arrival of a new water wheel, it was the “National” C.A.T. so I have a ‘node/loop’ in my brain that needs by-passing to fix this CAT title! I went up to CAT recently to find fibre glass moles and an aire of ‘theme park’ drifting in, but centrally, it is a few miles west of the HoBB and to this day, there’s nowhere like it. We were invited up to the ‘Earth Centre’ to do some ‘WoW Story Telling’ when it opened and whilst the whole place showed vast potential it failed to look attainable in the same CAT ‘backyard’ type of way. If you have not been to CAT yet, when you are over this way, remember to give yourself an extra day and go there. If you are touring around this area, don’t forget to see the architecture of Portmerion as well which is North West of the HoBB on the coast. Contact us if you want the local accomodation lists. Also, I’ll post up something on how Portmerion has used perspective and colour. Portmerion is close and also well worth a visit when over in this area.